IPM ... effective approach to pest management. Drainage systems in homes or commercial establishments can be breeding grounds for pests which are vectors of various diseases. MOHAMED ARIF HUSSAIN* highlights the ways and means to nip the issue in the bud. Most public health pests dwell inside sewage drains. Generally, these insects – for instance, mosquitoes – complete one of their developmental stages in moist and wet areas by either laying their eggs or developing their larvae. Drains are the access points for many pests into residential or storage areas. 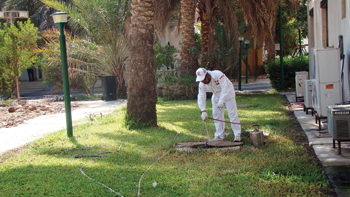 A proper pest management programme is, therefore, necessary to control drainage and sewerage pests on a premises. For this, a thorough knowledge of the related pests and their developmental stages is required, since merely spraying or pouring pesticides into the drainage system will not exterminate or eliminate the pests. The role of IPM (integrated pest management) will come into action where more than two tactics or measures are applied at the same time. A related problem here is water pollution. Polluted water acts as a host to several pathogenic microbes. Pathogens present in sewage water are responsible for spreading different diseases. Stagnant water facilitates the growth of mosquito larvae, which in turn cause diseases like malaria. Typhoid is another disease caused by contaminated water. Protozoans like Cryptosporium and Giardia are also present in sewage water, posing a great risk to human health. The main cause of water pollution is improper handling of waste water. Another reason is draining of waste water without treating it. IPM involves a sequence of procedures. The excessive dumping of organic waste causes eutrophication thus resulting in dense growth of algae which in turn increases the BOD (biological oxygen demand) and thereby destroying aquatic creatures in rivers, oceans and other water bodies. Toxins are released in water bodies through sewage water. These toxins are consumed by fish and other aquatic organisms, thus entering our food chain and consequently disturbing our ecological system. Government agencies like municipalities and pest control companies play an important role in maintaining the sanitation of cities or towns. • Determine the factors that affect pesticide selection and performance. IPM is an effective and environmentally sensitive approach to pest management that relies on a combination of common-sense practices. IPM programmes use current, comprehensive information on the lifecycles of pests and their interaction with the environment. This information, in combination with available pest control methods, is used to manage pest damage through the most economical means, and with the least possible hazard to people, property, and the environment. Although the basis of IPM is sanitation and non-chemical treatment, pesticides are at times required as an initial intensive treatment to minimise the pest infestation. Newly developed techniques like trapping and baiting are the most successful techniques in the building environment. These require less time to install, involve less or no toxic materials, and the monitoring is also easy. Also, the results can be quantified and verified more easily by trapping than any other method. There are rarely quick and easy ways of solving pest problems: not only must one deal with pests but also with people and conditions at the site. The best approach involves the integrated use of non-chemical methods and a range of insecticides which are suited for specific pest conditions. An effective pest management programme involves hard work, both by the PCO (pest control officer) and often by the customer. The basic elements of a pest management programme include: obtaining cooperation; inspecting the premises; developing recommendations for non-chemical measures as well as for chemical treatment; implementing initial and follow-up treatments; and monitoring the results. Sanitation ... key to controlling pests. There are many pests which reside in drains, such as cockroaches, drains flies, mosquito larvae, midgets, rat-tailed maggots, rodents, and other pathogens. Many more generally hide, reside or multiply in drainage or sewage areas. These pests cause health hazards and damage the residential properties. 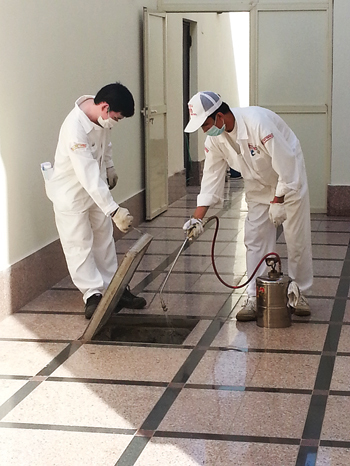 Masa Establishment of Saudi Arabia has a proven track record of 35 years of experience in the field of pest control. Quality and effective results are obtained through the use of a wide range of tried and tested pest control solutions. With a wide range of effective solutions at its disposal, Masa ensures clients of strict compliance with pest control legislation. 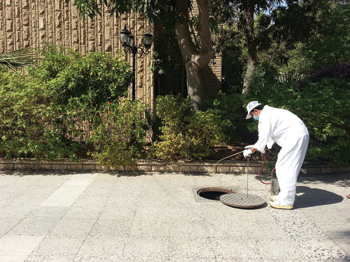 Masa’s service teams aim to achieve the full cooperation of the management and staff of the maintenance and sanitation departments, impressing upon all that this is a must for effective pest management. It has been proved that sanitation is the key element in controlling pests. A checklist is prepared to ensure that all the areas have been included. The sanitation report of the treatment also helps to notify the problems to the proper persons. • Mohamed Arif Hussain is an entomologist at Jeddah-based Masa Establishment for Pest Extermination, Maintenance and Contracting.